InfraCo Africa, an infrastructure development facility has signed a $2.2 million convertible loan agreements with energy developer Gigawatt Global for the development of the Samburu Solar and Transmara Solar projects in Kenya. The financing committed by InfraCo Africa will enable these projects to complete development activities and secure the financing needed for construction. InfraCo Africa forms part of the Private Infrastructure Development Group (PIDG), which is funded by the UK, the Netherlands and Switzerland. Earlier this month, UK’s Minister for Africa, Harriett Baldwin has announced the commitment by InfraCo Africa to develop the two solar plants in Samburu and Transmara, each with a capacity of 10 MWAC, to give more people access to affordable, clean energy. 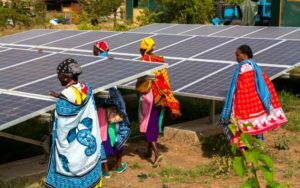 The British Department for International Development’s Transforming Energy Access program has already helped people and businesses across Africa cut 2 million tons of carbon emissions and improve the lives of 3.2 million low income people. “Through the Samburu and Transmara projects, the alliance between Gigawatt Global and InfraCo Africa demonstrate how solar can act as an essential cornerstone to empower rural and under-served populations,” said Gigawatt Global’s CEO, Josef Abramowitz. Last year, the Government of Kenya reaffirmed its intention to achieve Universal Electricity Access by 2022 and to continue developing the power sector. Posted by Emmanuel Agbenonwossi on March 20, 2019. Filed under Business, News, Zoom. You can follow any responses to this entry through the RSS 2.0. Both comments and pings are currently closed.